A5.com/CIAN shows their appreciation to their customers by hosting hors d’oeuvres and cocktails at the Cornerstone Unground, located in downtown Peoria. This historical venue was perfect to host a beautiful fireplace display provided by Hearth and Patio to set the mood for the holiday season along with festive decorations, music, and of course, great conversation. We really value our customers and are grateful that they came to celebrate another successful year with us. 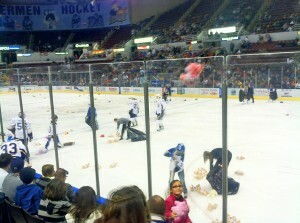 The November 24th Riverman game encouraged spectators to throw new/gently used teddy bears on the ice after the first Riverman goal. CIAN/A5.com took 50 bears and handed them to people near our seats to throw onto the ice. Employees from CIAN joined in the festivities and had a great time helping out the Salvation Army (which is where the bears will be donated). 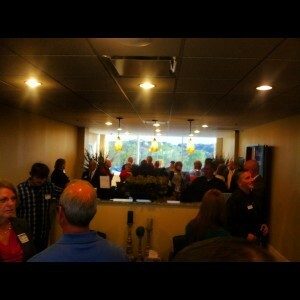 CIAN & A5.com host, for their first time ever, the Peoria Chamber Business after hours with Hall, Rustom, & Fritz L.L.C. The night was a hit thanks to Microsoft’s demonstration of Windows 8, Brewer’s donated beer samples, and exquisite Mediterranean cuisine catered by Haddad’s. At the event special “give aways” were raffled out and two lucky Chamber members walked away with an iPhone provided by Verizon Wireless, and a sports package that contained tickets to Rivermen Hockey games, Bradley Basketball games, and more. October was also the month CIAN was featured on the cover of the Peoria Chamber Magazine, where we also had an article discussing IT as a Utility. This month marks the half-way point in our project to complete our new Tier3 datacenter at 303 E. Washington in Bloomington, Il With an anticipated opening date of December 15, 2012, the aggressive pursuit has gone flawlessly. We’ve seen substantial progress including deployment of major HVAC and electrical systems, new walls and office space, and a new secure equipment yard for our mechanical systems. We now also have confirmation that (4) telecommunications companies will be deploying initially including Frontier Communications, US Signal, Stratus Networks, and Coretec. We have talked to a number of others including CIRBN, Comcast, and Windstream about potential deployments and look forward to helping solve your DR and cloud challenges! 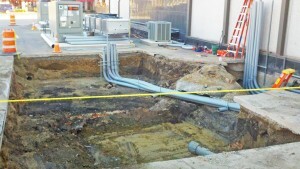 We hope to be completely moved in by December, 2012 at this pace. We’ve been very busy over the past months working with our general contractor and the team of specialists we’ve brought on board to make this new datacenter a reality. We’ve established the design of the first phase which provides over 6,000 sq ft of Tier3 datacenter space and up to 1Mw of critical power. The facility has both dual roofs and a hardened outer perimeter as well as 3 layers of physical security plus redundant HVAC, power, fiber paths and more including dual paths for our utility power from (2) separate substations! CEO and owner, Steve Hope was awarded the Employer of the Year Award Small Class by the American Legion. This award was presented at the 94th Annual Department of Illinois Convention in Springfield, Illinois. The National Economic Commission annually presents several awards at The American Legion’s national convention to honor employers who hire veterans, disabled veterans and older workers. 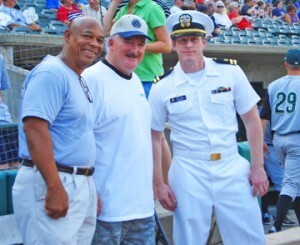 As a big thank you to our troops, CIAN, A5.com’s sister company, annually hosts the Independence Day Peoria Chiefs Baseball game, welcoming families to the park to honor our country and those who serve it. The July 3rd ceremony was kicked off by a full color guard and an astounding fly over by the airmen of 182nd Airlift Wing flying the C-130 Hercules at the end of the national anthem, sung by Chloe VanSlyke. Steve Hope, our CEO and owner, threw out the first pitch along with last year’s honoree Ron Ball and this year’s honoree, Kyle Thomas. After the game, O’Brien Field lit up with a firework displayed sponsored by CIAN as one last thank you. What do hackers (ethical ones), teddy bears and candy have in common? 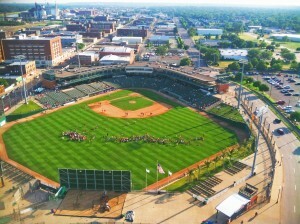 CIAN, Inc., a nationally recognized IT security firm based in Peoria, is teaming up with the Peoria Chiefs for some kid friendly events this weekend. The events occur this Sunday, June 24 at 2:00. The first 1000 kids 10 and under at the game will get a Peoria Chiefs Build A Bear. The furry bear will feature a t-shirt with a Chiefs logo on the front and a CIAN logo on the back. The candy itself will be dropped from a helicopter after the game and kids 12 and under can go onto the field and collect candy with bags provided by CIAN and A5.com. Kids will be placed in groups based on age and given a bag to collect as much candy as they can before it is all gone. Tickets for the game can be obtained by calling the Chiefs’ box office at 680-4008. About CIAN CIAN was founded on the East Coast in 1990 by a retired Navy cryptologist. He has 40 years of intelligence and national security experience. The company was originally established to install and maintain computer networks, but quickly progressed to become a recognized leader in migrating important information from legacy software and equipment onto state-of-the-art high technology systems. CIAN is the only Peoria area provider focused exclusively on creating customized network appliances to address client security concerns, remotely monitoring, analyzing, and securing government and commercial networks and customer information. CIAN, a CISCO, Symantec, and Microsoft Gold Certified partner has had a Peoria location for over five years. 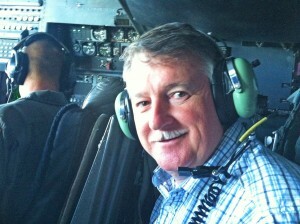 Steve Hope attended the 2012 ESGR Bosslift to Gulfport, Mississippi, June 19-21. The tour included the Combat Readiness Training Center, the Army Aviation Maintenance Center, the “Hurricane Hunters” operations at Keesler Air Force Base, and the Army Training Center at Camp Shelby, MS. Departure was by C-130 out of Peoria to Rockford for the Chicago area employers, then on to Gulfport, MS. A boss lift offers employers an opportunity to visit military installations throughout the nation to observe National Guard and Reserve members involved in training exercises. Employers see first-hand the quality of training and leadership activities their uniformed employees receive as part of the total force. Mr. Hope has experienced much of what was seen during Bosslift due to his time in service but still enjoyed the time sharing some of his experiences while engaging with the other business owners and building friendships while supporting our current military. A5.com, New Datacenter location selected—closing this month! We have finished the site selection process for the new datacenter location and have chosen a site in downtown Bloomington, Illinois. The site consists of approximately 30k’ of space including over 70 parking spots on an entire city block. The site is an already-hardened facility built by an insurance company originally back in the mid 1950’s and has many structural features that support our goal of a Tier3 facility design. Closing is scheduled for this month.